Remember this? Told you it would be mine! I sort of stalked Club Monaco for it back in January (and also dispatched a spy) and when i tried it on i was not disappointed. 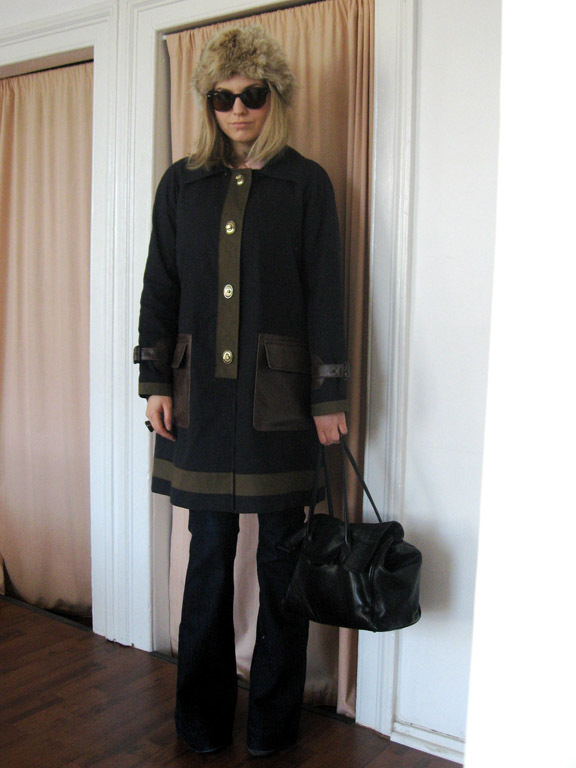 It's the perfect spring coat, has such a great length and the material feels incredibly luxurious, not to mention the amazing leather pockets and detailing. Side note on my chapeau: my mother gave this to me back over Christmas time as she was about to throw it away! That's right, garbage. Needless to say, i snatched it up (along with a few other items) before she knew what was happening. AAAAND now that it's actually feeling like spring and the days are longer, my energy levels and spirit are just skyrocketing. Finally. that jacket is gorgeos. love the contrast of black and brown. that hat looks so cozy! so good that you snatched it while you could. love the outfit. amazing as usual. From head to toe I love this outfit! Great coat! I haven't been to Club Monaco in so long, I need to pop in soon. LOLL you're hilarious!!!! re: dispatched a spy haha!!!! i love the pics evolution here!! like a how to in spring layers. and that coat! so glad it made it's way into your life! it's honestly made for you. and how cute are you in that hat ?!! only you could pull that off! OMG. I love your hat! OMG this is so funny! My father gave me & my sister both a hat just like that on Christmas! Mine was a darker brown and my sister's is the color of yours. They actually match our hair colors :) They were made by my great uncle who used to be a tailor for Valentino years ago.